May 23, 2016—COLLEGE STATION, Texas—The invasive emerald ash borer (EAB) beetle that has killed tens of millions of ash trees across the U.S. has been detected in Texas. State and federal agencies are preparing people and communities with information, education and preventative measures to fight the pest. Earlier this month, the U.S. Forest Service (USFS) and Texas A&M Forest Service (TFS)—agencies leading the U.S. Department of Agriculture’s (USDA) EAB survey in the state—trapped four adult beetles in Harrison County just south of Karnack, Texas. 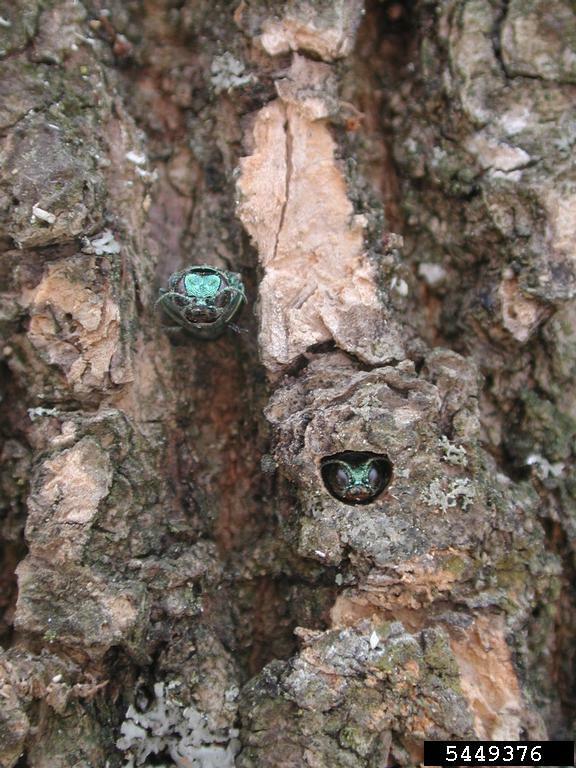 Although the ash trees in the immediate vicinity of the trap did not exhibit symptoms of the pest, the USDA’s Animal and Plant Health Inspection Service (APHIS) laboratory confirmed the specimens were emerald ash borers. Efforts are underway to identify any infested trees. Texas has anticipated the arrival of the EAB and has strategically placed beetle detection traps across the state for the past four years in an effort to provide an early warning if and when the invasive pest arrived. The EAB is a destructive, non‐native, wood‐boring pest of ash trees and poses a significant threat to urban, suburban and rural forests, killing both stressed and healthy ash trees. The trees typically die two or three years after becoming infested. Native to Asia, the EAB was first discovered in southeast Michigan in 2002. Since then, infestations of this invasive pest have been found in 26 states and have killed tens of millions of ash trees. In the United States, there are 16 ash species susceptible to attack—Texas is home to seven of these species. Ash trees make up less than 5 percent of rural Texas forestlands but comprise a large population of the state’s urban forests. Texas A&M Forest Service is working with APHIS, the Texas Department of Agriculture, and the U.S. Forest Service, among other state and federal agencies, to implement a response plan. The statewide plan includes monitoring beetle movement, conducting educational campaigns, providing technical assistance in prevention, preparation and recovery, and working with regulatory agencies in considering and establishing quarantines in affected counties. Texas A&M Forest Service is also working with the state’s forest industry, rural landowners, urban communities and homeowners on detecting possible infestation and taking measures to slow the movement of the beetle. Measures of control include protecting ash trees through the use of insecticide tree injections and soil drenching and bolstering the urban forests with other tree species not susceptible to the emerald ash borer. To learn more about EAB, please visit www.emeraldashborer.info and https://tfsweb.tamu.edu/eab/ Download the fact sheet and check out photos on Flickr.